of the equinox. Plato called this the Great Year. time and why consciousness may be expanding at an exponential rate. Understanding the cause of precession is key to understanding the cycle. of the ages over great epochs of time. distant lands, all pointing to a peaceful and prosperous culture. invention of agriculture and pottery is an archaeological enigma. scientific feats had essentially disappeared. What happened? their words for the “future” have now become our words for the “past”. whether he is in an ascending or descending age. resulting in the rising and falling ages of the Great Year. like periods and labeled them the Iron, Bronze, Silver and Golden Ages. is looking more and more ethereal just as the hoary Vedas predict. Oriental teachings about cycles indicate this is just a passing phase. read Greek mythology or pages of Vedic scripture. consider the story of Babel. Yuga) humanity spoke with one tongue and communed freely with nature. stories about mythical powers of saints and sages who have these gifts. last Dark Age was in 498AD. 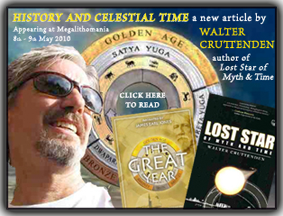 The final stage in the cycle of time is the Golden Age or Satya Yuga. to the wise observer it is a weathervane of the future. globe within the time it takes the planet to make one spin on its axis. something hidden in the background, we can expect some amazing changes. with an emphasis on history theory and cycles of consciousness. the precession of the equinox according to ancient cultures. meditation and Eastern thought. He is a resident of California.